Fast Print, a New Zealand promotional and printing company, manufactures and prints magnetic strip business cards. You buy these plastics cards which are similar to your debit, credit, loyalty or membership cards that have a magnetic strip on the back (minimum order size is 500 units). ...and virtually stores your contact and social media details on the data track of the magnetic strip on the back of the card. As with all magnetic strip cards, you'll need a card reader to read the information stored on the magnetic strip. Hence the reason why this type of business card is most-suited for retailers with Point of Sale (POS) card readers. You can then pass these business cards on to your potential customers at trade shows, business conferences and meetings. You can marry membership benefits to these cards, that will, along with your contact details, be stored on the magnetic strip on the back of the card. Since customers have to carry these cards around with them anyway, to shop at your store, you increase brand recognition, trial and loyalty, as these special business cards are always stored among other important cards that your customers frequently use - namely credit cards, ATM cards and drivers' licenses. Which represents a win-win situation for your business, as your revenue will increase from the additional exposure. Well, we've come to the end of our series on virtual business cards. Hope you enjoyed our posts. 1. Virtual Business Cards (Part 1): Would You InfoStripe? 2. Virtual Business Cards (Part 2): Will Mobile Apps Rule? ). ... and to update us re new virtual cards that may be in your country or region! (I'd like to thank Affiliate for the use of his Flickr inset photo, entitled, "Best Business Card I Got at Affiliate Summit East 2009". The photo shows the front and back of the magnetic strip business card he received). Virtual Business Cards (Part 2): Will Mobile Apps Rule? In our previous post on this topic, "Virtual Business Cards (Part 1): Would You InfoStripe?" , we discussed a new type of virtual business card - InfoStripe - where, instead of storing all your contact and social media details on a 3"x 5" business card, you only need to store one infostripe URL that points to them all. Today, we'll introduce three (3) mobile apps that are vying to make business cards obsolete. These are Bump, Hashable and Cardcloud. 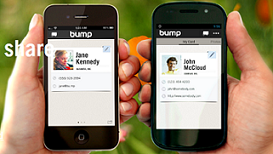 Bump mobile app (the larger picture can be viewed above), works on Android or iPhone smartphones. It's a cloud service which allows you to exchange contact details with anyone you bump your phone against. 1. You open the Bump app and enter your contact and other company details. 3. Both sets of contact details are immediately shared. 3. The app is free to use for now, and its developers say it will always be free to use. 2. Will only work with someone who also has Bump app installed on their smartphone. Hashable is being touted as the "best way to manage all of your important relationships on any device (mobile and desktop)". It is a cloud service that allows you to organize your contacts based on common interests shared, and where you met these contacts. These interests and locations are denoted by hashtags (#). 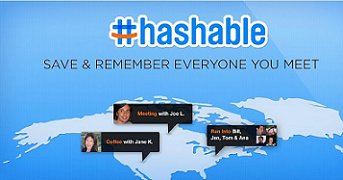 (Hashable allows you to share up to 99 of your social network accounts). 2. You can easily send quick follow up messages to contacts (e.g. meeting notes and thank you notes). 1. Both you and your contacts must have a Twitter account for this service to work, as Hashable indexes or stores your information based on your Twitter handle(e.g @gillipoo). Cardcloud is a cloud service that allows you to share contact details by phone-to-phone or phone-to-email. 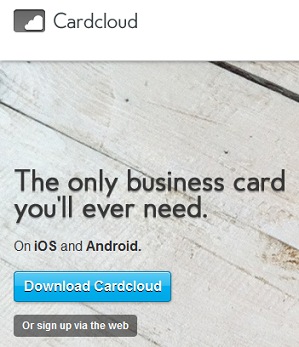 (CardCloud works on both the iPhone and Android smartphones). 2. Enter your username as "Fname" in the name field, along with your last name. 3. Import your contact information from LinkedIn or Facebook. (However, you still have to enter other contact details like your address, phone number, email address, social media network accounts and upload your company logo). 4. All this information is stored as your Cardcloud business card, which looks just like a business card, but instead, your contact information is stored virtually, as a virtual business card or vcard. 5b. Enter the recipient's' email address. Cardcloud will then remember the recipient and when, where and how you met him/her. You can use CardCloud tracking service to find contacts within a 5-mile radius of your smartphone. 1. You can share your Cardcloud information with anyone, as long as they have an email address. (They claim to offer phone-to-phone transfer of contact details, but no information is provided on their website re how this can be done). 2. Cardcloud remembers the context within which you met your contact (the location, when and how you met him/her). 2. You really can't experience the benefits of using this card (e.g. the tracking feature) without using a smartphone. (Although you can enter your contact details into Cardcloud, online, via a desktop, you really need a smartphone to access the "tracking" benefits of this app). So will mobile apps rule the business card landscape? I think they just might...especially in countries where smartphone usage is prevalent. ...Why spend hundreds of dollars to design and print business cards, when you can easily share contact details using your smartphone? Please stay tuned for our final post in this series, when we'll introduce a new type of business card that is popular in New Zealand. Virtual Business Cards (Part 1): Would You InfoStripe? For decades, paper-based business cards have been invaluable for providing easy contact information to potential customers, clients and business partners. However with the advent of the Internet and mobile technologies, there is need for a different kind of business card. ...Your potential clients and business partners can get your information virtually. In the case of the InfoStripe vcard that we'll introduce today, InfoStripe provides you with one URL which points to your InfoStripe page. On this InfoStripe page (really a stripe on a page), your potential clients and business partners can view your website address, blogs, Twitter, Facebook, Pinterest and other of your social media profiles, when they visit your InfoStripe URL. Additionally, potential clients/business partners can see status updates that you've written on each social network, thus giving them a better feel for who you are. ...Which enhances their ability to decide whether or not to do business with you. Will InfoStripe Make Conventional Business Cards Obsolete? ...Will InfoStripe make conventional business cards obsolete? Your name, title and InfoStripe URL. If you are having any delays in your upgrade, after paying by Paypal, please contact InfoStripe CEO, Harold Fudge, so that your upgrade can be enacted. Although this company charges a very small fee for an upgrade, this slight delay in processing upgrades, is something to consider when making purchases with this company. ...Thankfully, Mr. Fudge immediately responded to our query and the updgrade was enacted, immediately. If you are having any problems whatsoever, re this, please contact Harold Fudge and I'm sure he'll do his best to rectify the situation, speedily. In our next post we'll introduce you to 3-4 mobile apps that are are vying to make business cards obsolete. We'll give our opinion as to whether or not they'll actually achieve this goal and if these special virtual business cards are usable, globally. (The inset photo above, is the draft and abbreviated version of the InfoStripe page for our parent site: Market Opportunities Unlimited).